The CX5010 and CX5020 are Embedded PCs from the CX5000 series based on Intel Atom processors and differ only by the CPU version. The CX5010 has a 1.1 GHz Intel Atom Z510 processor, while the CX5020 has a 1.6 GHz Intel Atom Z530 processor. Apart from the clock speed, the two processors also differ by the fact that the Z530 features hyperthreading technology, i.e. it has two virtual CPU cores for more effective execution of software. Depending on the installed TwinCAT runtime environment, the CX5010/CX5020 can be used for the implementation of PLC or PLC/Motion Control projects (with or without visualisation). The extended operating temperature range between -25 and +60 °C enables application in climatically demanding situations. 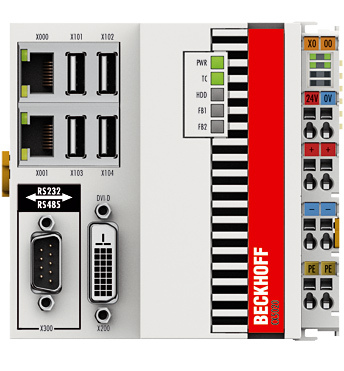 The CX5000 series devices are DIN rail-mountable, fanless Embedded PCs with direct connection for Beckhoff Bus Terminals or EtherCAT Terminals. The housing concept of this series is optimised for sturdiness and compactness, the individual housing parts are made of metal (magnesium). Apart from the electrical advantages of better screening and ESD protection, the user also benefits from the weight-saving magnesium construction. The I/O level can be implemented both with Bus Terminals and with EtherCAT Terminals. The connection of EtherCAT gives rise to many different extension options. Further master/slave fieldbus connections (PROFIBUS, CANopen, DeviceNet) or communication interfaces (RS232, RS422/RS485) and all other signal types accessible via EtherCAT can be directly connected as EtherCAT Terminals. Two independent Gigabit Ethernet ports and four USB 2.0 interfaces are available. A Beckhoff Control Panel or a commercially available DVI monitor can be connected to the DVI-D interface. Unlike the other CX device families, the CX5000 series has no option for expansion using attachable expansion modules to the left. There is, however, a factory-fitted option slot in the basic housing. For example, a serial port (RS232/RS422/RS485) or a fieldbus connection with master or slave function can be added here as an optional interface as required. Particularly worth mentioning is the function as an EtherCAT slave, as a result of which the CX5000 becomes a programmable local controller within an EtherCAT network. The operating system can be Windows Embedded CE 6 or Windows Embedded Standard 2009. An exchangeable, industrially-compatible Compact Flash card, which can be accessed behind a panel, is used as boot and storage medium. The Compact Flash card serves as a substitute for a hard disk, i.e. the operating system as well as TwinCAT and user projects are stored on it. This way, in the case of service, hardware can be exchanged quickly or a software update can be performed on site by simply exchanging the CF card. The built-in capacitive 1s UPS ensures secure backup of persistent application data on the Compact Flash card. The date and time are buffered via a replaceable battery. TwinCAT automation software transforms a CX5000 system into a powerful PLC and Motion Control system that can be operated with or without visualisation.